Yesterday Barry O’Reilly tweeted a picture of some positive feedback collected after a showcase. It immediately reminded me of the Feedback Door idea from Jurgen Appelo. You see, I always thought of it as being a great idea and have used it myself a few times but the picture I saw yesterday sewn a seed of doubt. The results were just too neatly clustered around “nice”. Now, don’t get me wrong, I have no doubt that the showcase Barry shared feedback from went very well and was skilfully organised. That’s not the point. 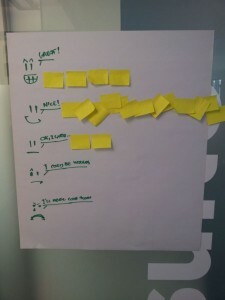 I am more concerned whether this way of collecting feedback in general is as useful as it at first appears. To understand why there might be a problem let’s recall the series of Asch conformity experiments where a person invited to give their opinion on a trivial problem was swayed to pick the obviously wrong answer after everyone else in their group picked the same wrong answer (deliberately). What effect could this have in the Feedback Door case? If you thought the event was rather bad but everyone else so far have rated it highly you might be more reluctant to reveal your damning opinion. Instead you could begin do doubt: “Perhaps I just didn’t get it, the training couldn’t have been so bad if everyone else thinks so highly of it”. Another angle to consider is what Tversky and Kahneman called the anchoring effect. In their experiments they have observed that people often base their answer (especially if they’re asked for a numeric value) on a number they have seen or thought about before being asked the question. So if you have just attended a session and you are unsure about how good it was seeing other people’s votes will anchor your own answer around that result. If you see everyone else giving out high scores you may skew your own result up, if no one else though it was good, your score may go down, compare to what you would have done had you not seen any other score. Overlay on top the problems identified as groupthink and it makes me at least slightly uncomfortable about the potential outcome of this public form of collating feedback. To counter the argument however, you might want to consider this much better option than not collecting feedback at all or collecting it after a much longer delay. Still, I would prefer an alternative which does not reveal one person’s view to others. 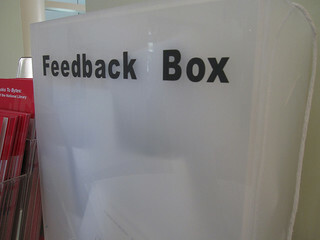 So perhaps a feedback box is better than a feedback door.